Sunday Mornin' Country promises to be the best ticket in town, blending top Country artists and your favorite Gospel music together for a time of celebration and inspiration along with great entertainment for the whole family. 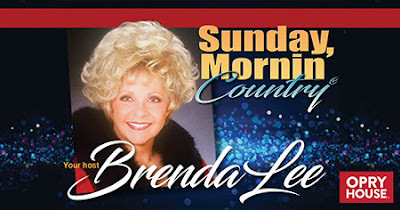 Again this year, the show will be hosted by the legendary, Country Music and Rock -n- Roll Hall of Fame member, Brenda Lee. Sunday Mornin’ Country is an event you won’t want to miss. This years show will be the 39th year that Country music artists come together to share their heart as well as their favorite Gospel songs. The event will take place on Sunday June 9 on the Grand Ole Opry stage. Tickets are available here. New this year, Sunday Mornin’ Country will be featuring A Soldier’s Child and a portion of the net ticket sales will go to A Soldier's Child. The (ASC) Foundation serves Gold Star Children of fallen servicemen and women from all U.S. military branches. ASC acknowledges all deaths during active duty and any deaths post military service, due to service related injuries or illnesses. This includes suicides from PTSD related deaths. ASC offers Love to the child left behind, Honor for the memory of the fallen and a Hope for the children to live a courageous life with yearly birthday celebrations, summer camps, mentorship programs, and facilitating secondary/college scholarships. Sponsored by the Nashville-based nonprofit, Music City Christian Fellowship, the concert has wrapped up the week at the conclusion of CMA Music Fest each year, leaving fans and guests with an uplifting memory of Nashville. Sunday Mornin' Country is the longest running named Country/Gospel event during the music festival. Keep current with Sunday Mornin’ Country on the Music City Christian Fellowship website and stay in touch on Facebook.